The Autobin 80 Litre Bin Maxi Series comprises of two models both of which are 80 litres in capacity. One is a single liner 80L stainless steel kitchen sensor bin and the other has a divider inside creating 2 equal compartments 40L + 40L for recycling. Both have proven to be extremily popular for the simple reason that premium quality stainless steel kitchen bins don't tend to be offered upto this size capacity. 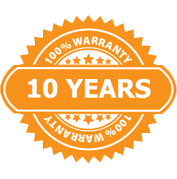 We have found that families of 6 or more want and actually need our 80L Maxi Series Sensor Bin. 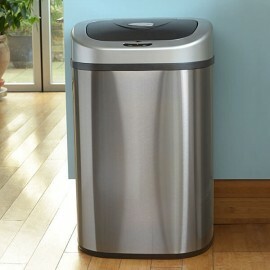 Families of all sizes who care to recycle love our 80L Maxi Recycling model. If you compare our Maxi Big Bin Series with all the other sensor bins in our range you will notice too the value for money with the Maxi Series. For example, compare our 50L Oval Series with our 80L Maxi Series, notice the difference in price and the difference in size! While comparing the sizes of these two bins, let it be said also that the 80L Maxi is the same height of the 50L Oval. This was designed this way very deliberately because while some people need an extra large kitchen bin, that doesn't mean you want your kitchen bin to look enormous in the kitchen. The 80 Litre big bin is just the perfect choice for any busy environments as its large capacity allows you to dispose of more waste while keeping any space cleaner and neat looking. Thanks to its innovative and stylish design, this large bin will look great in any context. These maxi recycling kitchen bins give you both, design and functionality in just one big bin with two separated 40L compartments for waste and recycling disposal. 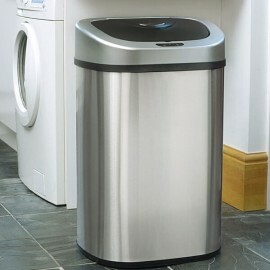 The perfect stainless steel bin, more rubbish management without wasting space, ideal for busy kitchens and workplaces.